The U.S. Postal Service unveiled four more stamps for the upcoming holiday season, as well as new releases and re-issues from recent years. The new stamps will be dedicated at first-day-of-issue events to be announced soon. Celebrate the holidays with Poinsettia, a new Global Forever stamp. This stamp can be used to mail a 1-ounce letter to any country where First-Class Mail International service is available. As with all Global Forever stamps, this stamp will have a postage value equivalent to the price of the single-piece First-Class Mail International 1-ounce machineable letter in effect at the time of use. These stamps can also be used domestically. The stamp art features a photo of a poinsettia. Taken from above, the photo captures the beauty of the green leaves, the red bracts, and the yellow flowers in the center of the plant. Poinsettias are now as much a part of the holidays as evergreens and mistletoe; tens of millions of plants are sold during the season. The new Global Forever stamps are being issued in self-adhesive panes of 10. Five centuries ago, Francesco d’Ubertino Verdi (1494–1557), the Italian Renaissance painter known as Bachiacca, proved himself to be a versatile and popular Florentine artist. Today, his work still vividly evokes the timeless traditions of Christmas. This stamp features a detail of Bachiacca’s oil-and-gold-on-panel painting “Madonna and Child,” which dates from the early 1520s, showing the Christ child clutching a bouquet of jasmine, a symbol of divine love, alongside the Virgin Mary’s profile, left shoulder and right hand. “Madonna and Child” is being issued as a Forever stamp and will always be equal in value to the current First-Class Mail 1-ounce price. With this new stamp, the Postal Service celebrates Kwanzaa with the seventh stamp since 1997 designed for the annual Pan-African holiday. Kwanzaa takes place over seven days from Dec. 26 to Jan. 1, and brings family, community and culture together for many African-Americans. The stamp depicts a man, woman and child adorned in a mixture of western and traditional clothing, paying tribute to the holiday’s focus on the contemporary African-American experience, while also drawing on African roots. The family is gathered around a kinara (candleholder), the warm light from seven candles (mishumaa saba) illuminating their faces. Several other important Kwanzaa symbols sit on the table — a few ears of corn (muhindi) and various fruits and vegetables (mazao); the kikombe cha umoja (unity cup); and the mkeka, a straw mat on top of which everything is placed. Created in 1966 during the height of the Black Freedom Movement, Kwanzaa was conceived as a unifying holiday during initiatives to end racial oppression in the United States. It draws on African traditions, deriving its name from the Swahili phrase “matunda ya kwanza,” meaning “first fruits.” With origins in Africa’s ancient and modern first-harvest festivities, Kwanzaa synthesizes and reimagines many of these communal traditions as a contemporary celebration and reaffirmation of African-American culture. Artist Floyd Cooper worked with art director Derry Noyes, who designed the stamp. The Jewish holiday of Hanukkah is celebrated with a new stamp issued jointly with Israel Post. Hanukkah celebrates the rededication of the Temple in Jerusalem in the second century B.C. after it was reclaimed from armies that desecrated the sanctuary. Tradition relates that during the Temple rededication — Hanukkah is the Hebrew word for “dedication” — the sacramental oil needed to light the lamps was enough to burn for only one day; miraculously, it burned for eight days until new oil could be pressed. To commemorate this story, celebrations include the ritual lighting of the hanukiah, the nine-branched menorah used only during Hanukkah. Eight branches hold candles representing each of the eight nights and days of Hanukkah; the ninth, the shamash or “servant,” is used to light the other candles. 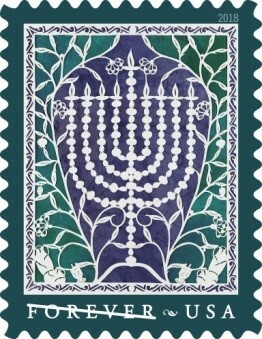 The stamp features a Hanukkah menorah created using Jewish folk art papercutting techniques. Artist Tamar Fishman made a pencil sketch of the design, then cut the two-dimensional image on white paper with a fine blade. She chose blue-purple and green papers for the background to highlight the central design. Behind the menorah is a shape reminiscent of an ancient oil jug that represents the heart of the Hanukkah miracle. Additional design elements include dreidels — spinning tops used to play a children’s game during the holiday — and a pomegranate plant with fruit and flowers. Hanukkah is a family-centered holiday, with celebrations taking place in people’s homes. Games, songs, gifts and food all contribute to making the holiday festive and fun for family and friends. Hanukkah begins on the 25th of Kislev in the Hebrew calendar, a date that falls in late November or December. In 2018, Hanukkah begins at sundown Dec 2. Art director Ethel Kessler was the designer. Tamar Fishman created the original art for the stamp. The Postal Service also recently announced Sparking Holidays, stamps featuring Saint Nick himself. These four new stamps showcase classic images of Santa Claus painted by famed commercial artist Haddon Sundblom. Each stamp portrays a close-up of Santa’s face; the four images are details from larger paintings created by Sundblom and originally published in ads for The Coca-Cola Company from the 1940s through the early 1960s. Sundblom is the man credited with refining the modern image of Santa Claus. Art director Greg Breeding designed the stamps. In 2016, the U.S. Postal Service released the Diwali stamp celebrating the festival also known as Deepavali. One of the most important annual Hindu events, the holiday celebrates the triumph of good over evil. The stamp features a photograph of a traditional diya — a small flickering lamp made from a bowl filled with oil — and flower petals against a glimmering gold background. “Diwali” in white type is featured underneath the diya. During Diwali, diyas dot the homes of observers around the world. Diwali is an important festival in several other religions as well, including Buddhism, Jainism and Sikhism. Spanning five days each autumn, Diwali is considered by some to be the start of the new year. In 2017, Diwali will be celebrated Oct. 18 (for South Indians) and Oct. 19 (for North Indians). Greg Breeding designed the stamp with a photograph by Sally Andersen-Bruce. William J. Gicker served as the project’s art director. With a design that evokes centuries of tradition, this stamp featuring gold calligraphy and an olive branch against a brilliant blue background was first issued in 2016 and commemorates the two most important festivals — or eids — in the Islamic calendar: Eid al-Fitr and Eid al-Adha. On these days, Muslims wish each other Eidukum mubarak, the phrase shown in Islamic calligraphy on the stamp. Eidukum mubarak translates literally as “May your Eid be bountiful (or blessed),” a phrase that can be applied to both Eid al-Fitr and Eid al-Adha. Artist and calligrapher Mohamed Zakariya worked with art director Ethel Kessler to create this design. The Postal Service celebrates Christmas with a stamp featuring a traditional Nativity scene. The stamp, originally issued in 2016, features a peaceful image of the Holy Family silhouetted against a dawn sky. The baby Jesus lies in a straw-filled manger in the center of the picture with Mary kneeling to the right and Joseph standing to the left, holding a lantern. A bright star shines over the scene. The Gospel of Luke relates how Mary and Joseph traveled to Bethlehem to register for the census decreed by the Roman emperor. The Gospel says: “And she brought forth her firstborn son, and wrapped him in swaddling clothes, and laid him in a manger; because there was no room for them in the inn.” Art director Greg Breeding designed the stamp with original art by Nancy Stahl. Celebrate the season with four of America’s favorite Christmas carols. Composed in the mid-1880s by James Pierpoint, “Jingle Bells” is one of our most recognized and popular holiday songs. Two very different towns, both home to the composer, lay claim to the song: Medford, Massachusetts, and Savannah, Georgia. Although it is not certain who wrote the original lyrics for “Deck the Halls,” the Welsh tune was published in the late 18th century. Some sources claim an American origin for the familiar words we sing today. Possibly the most beloved carol of all time, “Silent Night” has been translated into dozens of languages. A poem originally written in 1816 by Austrian Joseph Mohr, it was put to music two years later by Franz Gruber. The lyrics for “Jolly Old Saint Nicholas” were adapted from a children’s poem “Lilly’s Secret.” The song was first published in the 1870s, but the tune’s composer is unknown. The late Howard E. Paine was the art director. Artist Steve McCracken created original art for the project. Christmas Carols stamps are available as Forever stamps in booklets of 20. This Christmas stamp features a detail of Madonna and Child, a 15th-century tempera-on-panel painting in the Widener Collection at the National Gallery of Art in Washington, D.C. The painting is dated to circa 1470, and its anonymous artist is known only as “a Follower of Fra Filippo Lippi and Pesellino.” Art historians have speculated that the painter may have had preparatory drawings or close copies of the works of the masters he imitated, and that a relationship may have existed between those artists’ workshops and the workshop of this anonymous painter. William J. Gicker served as art director for this issuance. This bright and colorful stamp design celebrates the annual non-religious holiday of Kwanzaa, which takes place over seven days from Dec. 26 to Jan. 1. This stamp was first issued in 2016. Kwanzaa derives its name from the phrase “first fruits” in Swahili. The holiday honors African-American family, community, and culture. The stamp art features a young African-American woman as the embodiment of Africa. She wears a lavender dress with a collar of African design that also appears in her earring. A large purple bowl overflows with fruits and vegetables, symbolizing the abundance of African first harvest celebrations. Artist Synthia Saint James worked with art director Greg Breeding, who designed the stamp. Hanukkah spans eight nights and days of remembrance and ritual. The U.S. Postal Service joins the celebration with an inviting stamp originally issued in 2016. The stamp art depicts a menorah in the window of a home, viewed as if from inside a room. The white window trim is visible through the branches of the menorah, which echo the tangle of snow-covered tree branches beyond the glass. Art director Ethel Kessler designed the stamp with original art by William Low.